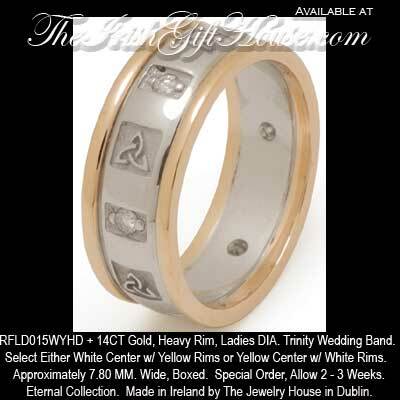 Eternal Celtic Wedding Bands - Ladies Diamond Celtic Trinity Knot. Select Either 14K White Gold Center with 14K Yellow Gold Rims or 14K Yellow Gold Center with 14K White Gold Rims. 14K Gold, Heavy Weight Rims, Ladies Diamond Celtic Trinity Wedding Band. Approximately 7.80 MM. Wide, Boxed. Special Order, Allow 2 - 3 Weeks.